Iris loves exploring and spending time at the creek near her house. She can also talk to dragonflies, even though no one believes her but her best friend, Grace. Iris and Grace can also talk to one another in their heads - which is surreal but kind of cool. When Iris' parents decide to spend summer vacation in Ireland, Iris is enraged. She doesn't want to leave her dragonfly friends, but she doesn't get a vote. Arriving in Ireland, Iris soon forgets her anger and loses herself in the beauty of Ireland. There is a crumbling castle to be explored, woods and a cave. When she touches the stones of the castle, she receives visions of what happened in the past. She questions her grandmother about them, and she explains to her how she had a dragon's tooth and it held immense power. Iris' grandfather used it for gain and was ruthless. The tooth has now been hidden and will only be found by someone who should find it. Unbeknown to Iris' grandmother, Iris finds the box holding the tooth and smuggles it back home. Back home, Iris' keeps the tooth hidden and begins to research about dragons. She believes they are real, even though everyone thinks she is crazy. Also, her creek is in trouble. Someone wants to come in and put a shopping center there. Iris is determined to save the creek and her dragonfly friends, and she will do whatever it takes to succeed. She gathers the help of her friends and an old man offers his aid, as well. They petition the town to save the creek, and their teamwork and friendship creates a unique bond between them. But when danger comes close to home, Iris needs to decide what's important - the creek, the dragons or her life? 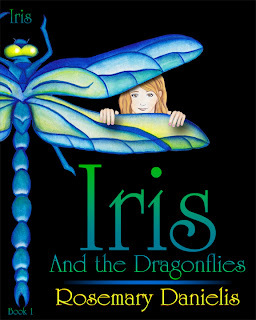 Iris and the Dragonflies is an enchanting and lively read! With mystery, unique supernatural gifts, friendship, saving the Earth, adventure and the journey of growing up, Iris and the Dragonflies is brimming with delightful secrets and daring situations. An educational and entertaining read for any age! Wendy, thank you for this insightful review! You made my day.